I've just bought a spare Wolf wheel, so called because of their usage on the Army 'Wolf' Land Rovers. 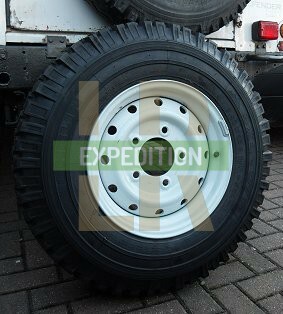 They are technically Land Rover's Heavy Duty (XD) OEM steel wheel, fitted to Defender 130's and as an option on other Defenders. 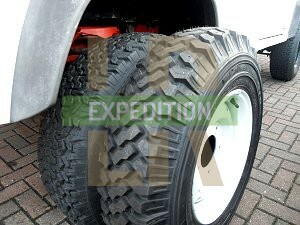 I regard them as an important addition to an expedition Land Rover for their strength and durability. With my grand scheme of getting a full set of Wolf wheels for my expedition Defender this was a steal at £50; brand new on eBay from a Red Cross Defender! The come in two varieties (NB. see below): Tubed (Part no. ANR5593) and Tubeless (Part no. ANR4583) costing around £45-60 each with a dimensions 16x6.5 inches. They are an inch wider than the standard 5.5 inch Land Rover steel wheels, so they can comfortably take a 235/85/R16 tyre, but it may be legally pushing it for 265/75/R16. Genuine Wolf Wheels are quite expensive, so there are replacement wolf wheels available. They have a rated strength of 2200KG, which working out as 8800KG for the whole vehicle seems a little extreme, but from the viewpoint of an expedition vehicle they can take a fully loaded Defender comfortably on one wheel - a possible situation you may find yourself in on tricky terrain. Although there are strong alloy wheels on the market, the strongest of these - the Blindo - is only rated to 1550Kg. You may never load or pound your vehicle enough to need the strength of a Wolf wheel but it would be better to overcompensate than under. At any rate, a steel wheel is also a must for off road expeditions as they can be hammered back into shape it necessary, whereas alloy wheels have a tendency to shatter. A Wolf rim isn't the only "stronger" Land Rover rim on the market. My first Defender ran with 7x15 Modular wheels. 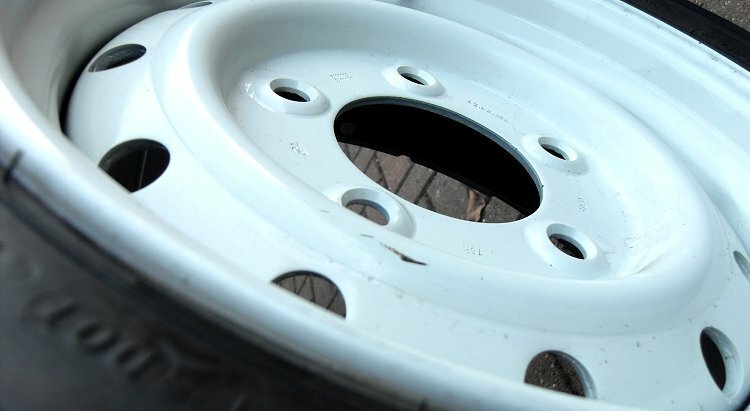 These can take wider tyres such as the 255/75/R15 fitted, and are cheaper at about £30 each but their offset (distance from the hub face to the rim's inner edge) is greater meaning that the wheels sit wider. This increases stability but reduces turning circle and may leave brake components less protected from debris than designed for. In my case, the tyres on the module wheels are an inch shorter than the Wolf wheels with their standard 7.50R16 tyres, which means the speedo is out by about 5% and my top speed and fuel economy are lower. Accelaration is better but I think i'd be better off with a set of standard wheels/tyres. There are two types of Wolf rim. (Well, three but ANR1543PM is superceded). The ANR5593 is meant to be used with tubes whilst the ANR4583 with tubeless tires. Tubeless tyres are considered to have better strength and durability, but tubed tyres are easier to repair. Personally, I would prefer tubeless for their stronger sidewall protection. The one I bought is an ANR5593 Wolf wheel with a tubeless Michelin XZL Mud terrain tyre fitted for military use. So why did I buy a tubed rim? The consensus is that you can fit tubeless tyres to tubed rims with tubes, but not tubed tyres to tubeless rims. This is because tubeless rims have an extra ridge that eventually wears on the tubes. Although, it is also said that fitting tubeless tyres to tubed rims are prone to leaking because of the bead not sealing properly, but there are also accounts of this not being an issue. The Wolf wheel you don't want to use with tubeless tyres is ANR1543PM, as this is a Tubed rivetted construction and is not as air-tight as the later welded rims. In any case, this tubed wheel/tubeless tyre combo probably has a tube in it - the best of both worlds. I would see fit to use this as a spare wheel. Just a bit of bargain hunting - after all, expeditions have budgets.